Crying inside, mad at myself, angry at God. My alarm didn’t go off today, not that I slept through it, or hat I didn’t set one, it didn’t go off and I slept right up until we had to leave. I missed breakfast, the fellowship and conversation of the team, and barely caught the morning devotional. I spent all my time this morning, which wasn’t much, writing and attempting to relay my thoughts. I had someone grab me a few slices of plain bread to eat so I wouldn’t pass out today. Mike Partain bought me a Mountain Dew, sweet man, and we hit the road with fire in our bellies for the work ahead. We were greeted at hope by 13 happy, healthy African children! They sang us a song and the hope on their faces: you couldn’t help but smile in return. They blessed us with several songs that they sang and we sang with them. These kids are our legacy, they will continue our work here, and seeing the growth in them in just a year, it’s amazing! There were more than a few tears shed among the team, especially among the members who had never seen these kids, their love for total strangers. God used these kids to a blessing when we thought we came to bless them. Due to our ministry’s regulation on media on Hope property, only the media authorized members of the team were allowed to capture footage of this. So none of this was taken by myself. One of the first things you’ll notice after staying on Hope property for a decent length of time is that there is not a bathroom at Hope, but there is a pit toilet. Pit toilet: a concrete room with a single hole in the floor, sitting on top of a large pit in the ground. Essentially it’s a stripped down porta-potty. You will never meet a greater “hold your breath challenge” than when you use a pit toilet. The women’s ministry that the ladies of the team went to accomplish was as much a blessing to our women as it was to the Ugandans. Mom told a story after the conference of how they gave each of the 180 women a gift, some hotel soap, a toothbrush, and toothpaste. Something as small and insignificant as that could be used in such a powerful way! As the story goes, there was a group of women laughing after the conference. Mom went over to ask them why they were laughing and it was because they had never smelled anything as good as soap before. They were so happy they couldn’t stop laughing. Something as small as soap could bring something as big as hope to these women. In other news, the team from Atlanta finally arrived at Hope! Now all except Vicki are here safe and sound. We are still praying Vicki arrives quickly and in good spirits to begin ministering to the people of Uganda! The luggage of the Atlanta team is lost somewhere between here and Washington D.C.. We hope it finds its way here soon as many of the medical supplies are in the luggage. Yes, you read that title correctly. The fridge is 30 inches wide and the doorway is significantly more narrow(I didn’t measure). The only alternative was to completely remove on of the side windows and hoist it up and into the bus from there, which worked out perfectly because we were removing the windows to be painted anyway. For those of you who saw pictures of the windows before, they were an odd light bluish color and didn’t match with the gray of the rest of the bus; the reason for this being that they were custom jobs taken out of another coach and installed into ours. Not wanting to leave them that wretched color, we found a shop to paint them. First however, they had to come out of the bus. The first step was getting up to the windows, for this we thanked God for The Flash(our red, Ford Expedition). These pictures are slightly out-of-order, but we drove The Flash underneath the window and two of us climbed on top of the van. The way it had to work was that we would raise the window off the sill and place on foot there and the other on the roof of The Flash. We would then lift the window out of the channel and hand it down to the third man on the ground who would hold it until one of the guys on top could slide down and help him maneuver the window into the back of the van. You can hardly see that funky blueish color, but this is one of the old windows. It almost looks greenish/grey. Well, that one went into the back of the van and then we pulled around to the other side to repeat the process for the matching window. Here’s what the bus looks like from the outside, looking through an empty window frame right now. It’s sitting in a farm workshop near Dunn, NC where a family has offered to not only allow us to park and work on our bus, but also stay in their home for several days. God is amazing! Well, the windows went out and came back a nice ebony black color.Which looked a little like this next picture. We pulled those out of the back, remounted The Flash, and put them in place. Now the bus looks more normal in the front. However, before we put the windows back in, we needed to get the new fridge into the bus. This was about 10 times a tricky and difficult as the windows were. The easy way to do it would’ve been with a forklift, however, we didn’t have one handy and so we did it by hand. You’ll never fully appreciate your refrigerator until you’ve lifted it, by hand up through a bus window. So, this was the basic objective: lift the fridge vertically up onto the stepladder, get a guy inside and feed it up onto the window sill horizontally, then slowly pull it into the bus and then set it upright. It sounded easy enough, but those things are a lot heavier than they look. It took a lot of effort and strain, but eventually we had success. Yeah, the bus is a mess right now, but the fridge looks great! Oh, and if you were wondering, it’s not going to stay there. We have a much more convenient place for it, I’m just excited we got it in. The fridge was by no means the most difficult thing we’ve done on this project so far, and it is far from over. But, little by little it’s all coming together. So, there you have it. If you’ve ever wondered how to get a fridge through a bus window, you just need three guys, a stepladder, and a little faith that it can be done. I think I’m going to call this fridge “Mountains”, that way I can say that I had faith and moved mountains. 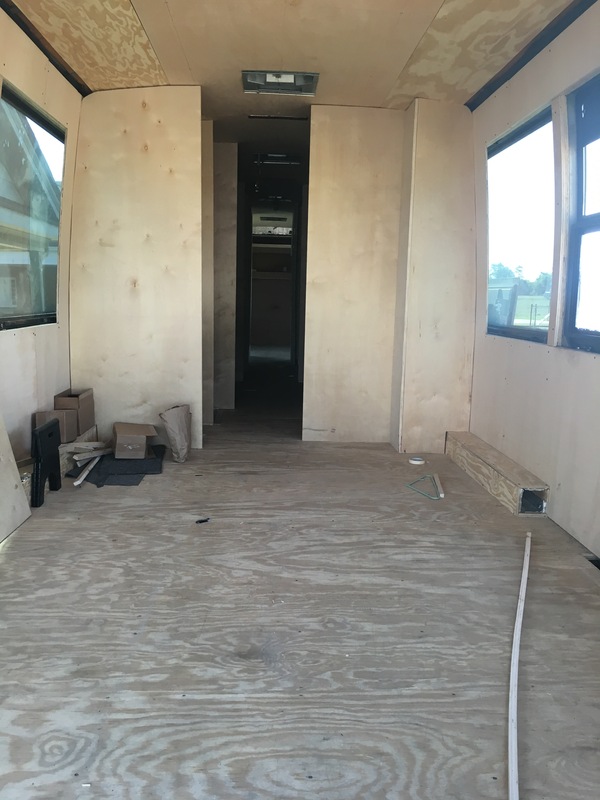 As always, thanks for reading, and keep up with me on Twitter and Facebook for more info and pictures as the building of the bus progresses. I was originally going to title this post, “The Gospel: For Dummies”, but I’m done with insulting people for the cause of Christ. I can’t demean someone to the cross. Though their sins be reprehensible and their faults many and great, as such were ye in evil lost, ’til Christ did darkness break. I posted to twitter yesterday my opinion on the Captain American boyfriend issue. It is disturbing to me and physically upsetting; I said as much in my twitter post. From that post, a conversation sparked between myself and a lesbian girl about religion, God, and what sin is. To ensure I remained above reproach, I kept the conversation public until it took a turn into matters which required much more in-depth answers. I moved the conversation to a private, group chat including my uncle, who is a pastor, so that we could discuss with her more extensively the gospel of Jesus Christ for the salvation of her soul. I am currently still in conversation with this young woman and would appreciate your prayers for wisdom to say the word’s God would have me say to reach her heart for Him. I know He doesn’t need my help, but this is a opportunity of an eternity for this young woman to hear the simplicity of the gospel, and I pray she would respond to God’s promptings. This situation has caused me to realize the importance of simple, straightforward gospel teaching and preaching for our hurting and broken world today. I know it takes an enormous amount of courage to share the gospel with someone, and you may even be afraid of messing it up by not knowing the right verses in the right order, or the proper magic formula to save someone. Let me just tell you this: God saves, not Man. He will use your willingness to reach souls, He doesn’t need your practised speech or prepared prayer: He will use you in whatever state you come to Him. Start with the basics. First, level the playing field and admit that you suffer from the same curse they do. They are no worse in God’s eyes then you are because everyone is a sinner and we all disobey God. Then make them aware of the consequence of our actions. Once they see you as being in the same boat as them, so to speak, they will listen to you as an equal. In the same way that a thief gets punished for breaking our laws, sinners get punished for breaking God’s. There is hope even though we are all sinners. God gave us a gift of eternal life in spite of our sin and ourselves. But, why did God give us the gift of eternal life and how? While we were yet sinner, unlovable, unlovely: God loved us and sent Jesus Christ to die for us. If we would call upon His name and ask Him to be the Lord of our life, we will be miraculously saved, from death to life, sinner to saint. When we surrender to His lordship, we are crucified with Him, and yet still live; though it is no longer our selfishness that lives, but Christ’s mercy and grace that lives and loves through us. This is the gospel for sinner, salvation for the lost. Let’s preach the word until all have heard the mercy of the Lord to a lost and broken world. This gospel, this grace, this Jesus changes everything. Hey everyone, I’m back to normal; hopefully. I know I’ve been a bit careless, a tad intense, and maybe even offensive in the way I’ve been articulating these posts recently. I have had very little time and inspiration to do these, but that is no excuse for my actions. Well, now that that is out-of-the-way: many of you know that in the late months of 2014 a pilot episode of what was supposed to have been a series on my family aired on TLC. Since then, things have happened. Many things are different, and it’s thought-provoking, and mildly disturbing to see how far we’ve come since then; also to see the things that haven’t changed. This year it seems we’re making a tour of all the places we visited in 2014, many of them significant. Last night we sang at the church where the filming originally began for that pilot episode, (which is now being called a “special”). It is where we met most of the crew for the first time who would be practically living with us for the next few weeks. This is where things started. But more than a dozen, close to a score of places where we were during the filming, we have visited over the course of this year. It’s sad, because many of the crew had become friends. It’s nostalgic, because it seems so long ago that all of this took place, but it hasn’t even been two years ago. We’ve come so far in the past 22 months. 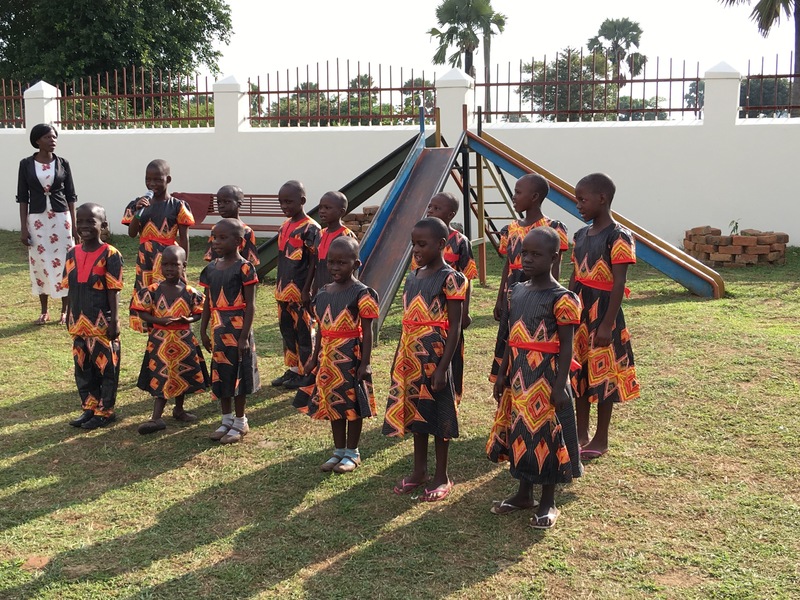 Since the filming of “Home Sweet Bus”, (the special on TLC), We’ve had 13 children find hope and a family at our orphanage in Uganda, Africa. Since the filming we have wrecked a bus and purchased a new one. Since the filming, my oldest sister got married. Since the filming, our lives have changed and we have experienced the hand of God in mighty and astounding ways. These last 22 months have been a nigh unbelievable journey. I wrote a book, Josh acted in his first feature film, Caleb and Steff had another little boy. Life has moved on since TLC. Really, I believe God took that opportunity away for several reasons. At first, it was awkward to experience the fame, however brief it was. At first it was all-in for God, and make His glory our #1 priority. But then, it was the spotlight, it was a smoke and mirrors trick: give God glory, get all the fame. I’m not saying this on behalf of my family, this was just me. The lights of stardom can often blind us from our goals we were so sure we would hold to before we were “famous”. We’ve moved on, regretting the loss of an opportunity to make Christ known, but accepting that He didn’t need a TV show to do that. We’ve become wiser, more committed, more focused. It helps to remember that we did not seek out this chance to be on national television. The Lord gave it, and the Lord has taken it away. Does that mean I don’t believe He can revive this opportunity and use it again for His glory? No. It means I have faith that whatever happens, He will do what is best for me, my family, and the furtherance of His kingdom and glory. I’m still living a bit of nostalgia, but with no regrets, and no remorse. God will do what God will do. I trust Him whatever may happen, and can’t wait to see what He does next. My leg hurts. I suppose that’s a consequence of ramming it into the handle bars of a four-wheeler after an unsuccessful ramping attempt on a grass slope. You see, there was this 100 foot slope, 20 feet at the top and I took it at about 30 MPH. At the base of the slope there was a small ridge coming off a small ditch. I slowed down a little at I came to it but not enough. The four-wheeler went up and the front tires hit first. I flew forward and came close to flying over the handlebars. Luckily, I had my foot under the gear change switch and my hands tight on the handle bars. As I flew forward, my foot caught on the gear switch and it clicked up as I let off the gas, that combined with the rapid incline change caused the motor to shut down. Still, I flew up and my thigh hit the handle bar painfully hard. So… I’m sitting in a car on the way to GA and my leg hurts. But pain is a useful trigger for memory and stupid should be remembered. Think about this: pain is a way for God to get us to remember. What if we feel pain as a way to remember. Think about it, you could faintly remember diving from a cliff with friends in to the river, but if you hit your leg on the cliff or cut your foot on a sharp rock, immediately that pain registers and pulls that memory to the forefront of your mind. Pain isn’t always to teach us a lesson. Pain is to remind us of the lesson we’ve been taught. What better way to remember than because of how much it hurt to learn how to trust, how to wait, how to forgive? Well, this is new and exciting in my life: I started a group on Facebook called “Bible Book Club”. The name is relatively self-explanatory, but basically it will operate like a normal book club. We will take a chapter of the Bible every Thursday, read it, discuss it, and then choose another to read for the next week. I’m hoping to build this and encourage and uplift other siblings in Christ through fellowship and study. That’s the goal: to inspire each other through godly fellowship and an understanding of God’s Word. It’s the greatest book ever written, so this should be the most profitable book club ever begun. But, it wasn’t my idea. Though I may lead it, I don’t accept credit for the idea. I was simply typing out a Facebook post about how we’ve lost sight of the Scriptures and how they were still relevant and important, tagging a picture I took of a Church Bible from the late 1800s. In the middle of my typing, my sentence turned as the spontaneous idea to form this book club sprang into my mind. My idea…? Perhaps. But, I didn’t think it on my own, I did not conceptualize it, I only received and related it into words. I truly believe this is an idea from God that is directly for my benefit and that of those I care most about. I pray that this is helpful to those involved and inspires and encourages us all as we learn and grow in Christ. Study to show thyself approved unto God, a workman who needeth not to be ashamed, rightly dividing the word of truth. This is our purpose. This is our goal. If you would join us, you can click here and become a part of this new and exciting opportunity! If you don’t have Facebook, I’ll be chronicling some of the discussion here on the blog every Friday and holding devotions on the selected passage every Thursday so that you can add your voice and your thoughts to the discussion as well. I love you all and pray God uses you in great and impactful ways to change your world. Those pictures summarize the work on the bus over the past few weeks. It’s coming along, starting to look more like what it eventually will be. A lot of fixing had to occur, recutting, refitting, and redesigning, but at least everything is now square and proportionate. 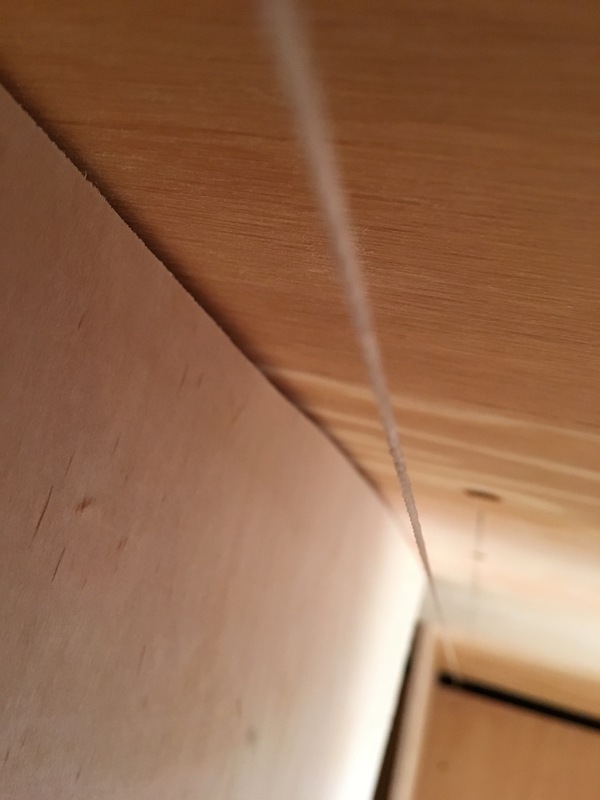 This is the basic, unwrapped dropceiling in the front that we built over those rafters I showed you in an earlier post. The wire is an average extension cord that will run the electirc from the inverter to the can lights that will be fitted into those hole after we wrap the wood with vinyl or whatever we’re planning to wrap it with. 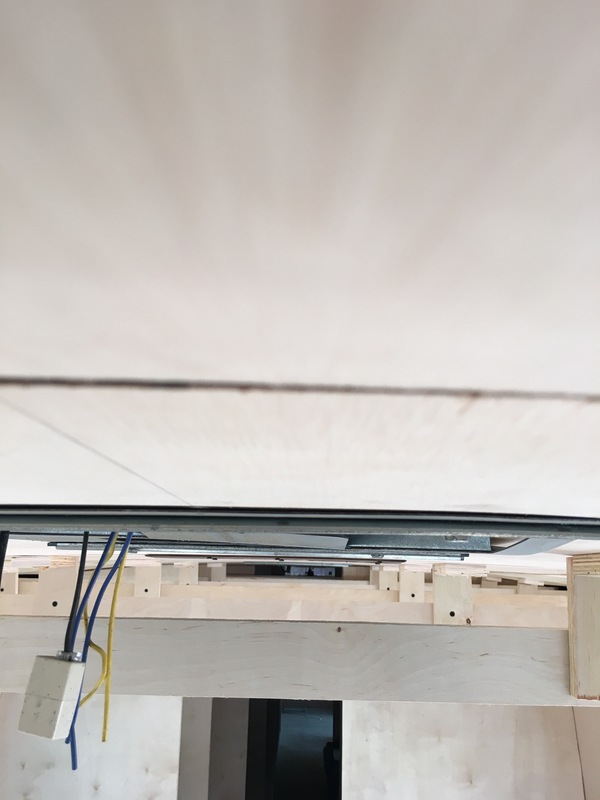 This is the basic support for the drop ceiling in the back. This is basically where the drop ceiling will rest and screw up into. You can see the closet space on the right, each one of those slots will be a door to access a single, large closet. 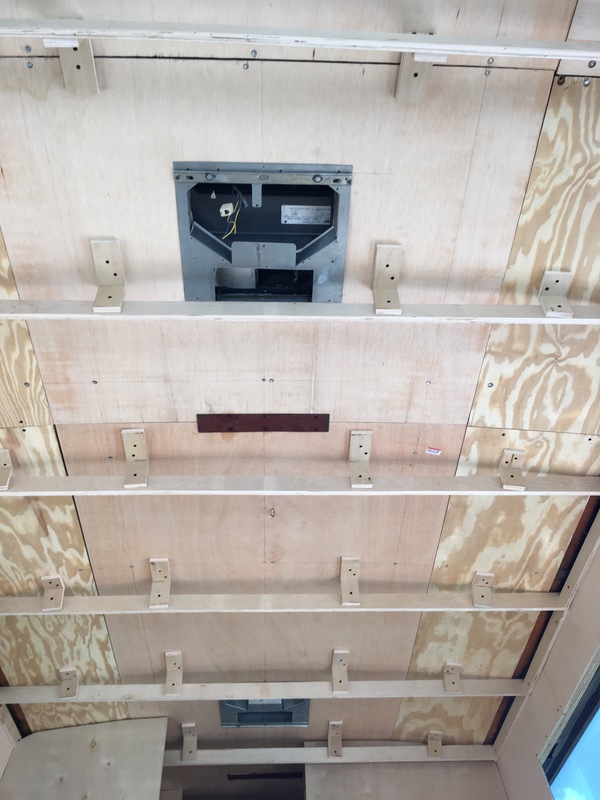 This is the unwrapped wall and ceiling boards for the bunk, and outlet cutouts in the wall. 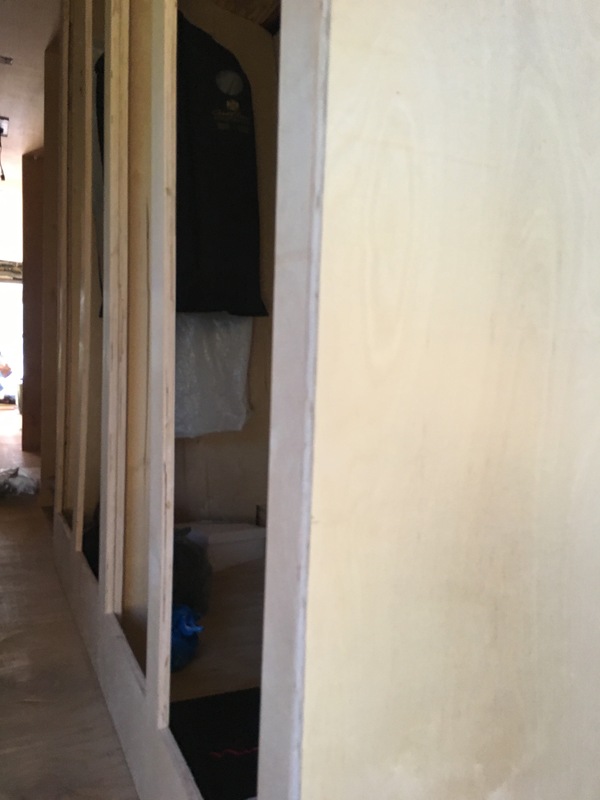 The slots had to be cut out using an oscillating tool and are on the back wall of all 6 bunks. This is Dad’s project: building the frame for the back bed. This bed will be Mom and Dad’s when it is completed. Those slots on either side are for closets, and the frame above the bed will be cabinet space. The are undet the bed will likely house drawers of for clothing. As you can see, the electrical is in place for the AC units, but is not yet hooked up. We’re still working on that. In the front room, on the right side as you walk into the bus is this contraption. This happens to be the basic frame for the kitchen counter and sink area. Its position cuts into our space in the front where we had been storing the lumber, but we’ve been able to work around it. Things are practically building themselves before our eyes, but it definitely takes some work to get it all together. I’ll keep you updated as things happen so you can be along for the ride with us as we continue this wild journey. So, You Think You’re Worthless? Paul says that of sinners he was chief. Paul was right. But for this day and age, I am Paul. Though I have never acted upon many of the things that prey upon my soul daily, I feel I’m the worst sinner of all. I’m a lust-filled, prideful, spiteful, arrogant, fleshly, independent, self-centric, idolatrous, carnal and fallen man. I’m even taking pride right now in my use of adjectives to describe myself. I am broken. I am worthless. I have nothing to give. I am talentless. I am hopelessly lost, and without grace. I am a dead man living in the shadow of life. That is who I am. That is not who I want to be. When we sin, we grieve and quench the Holy Spirit. When we quench the Holy Spirit, His transforming work in us is hindered. I don’t want to sin. I hate sinning. Because I know the nails that pierced His hands were the price of my forgiveness. And when I sin, it not only hurts me, but it hurts Him. So, you think you’re worthless? So you think you’re without hope? Abandon, left for dead, at the end of your rope. Well, maybe you are. But forgiveness is for the broken heart. Until we realize, that our only worth is to Christ, and the only worth we will ever be to the world is through Christ; that without Christ we are worthless, we will never live lives of value. I am worthless. I recognize that, I admit that. Not because I want to be forgiven: for grace is the abhorrence of a sin filled heart. It is the irony of the nature of Man that the one thing we covet and desire most we revile at the mention of and detest because of a lack of understanding. Our minds can’t understand grace: that someone we hated loved us; that someone we willingly slaughtered would forgive us; that someone would even want to spend eternity with His own enemies so much so that He would sacrifice Himself. This is grace. We don’t want grace. We can’t fathom grace. And yet we need grace. Somewhere in the hearts and souls of men we welcome and except punishment for crimes. We take satisfaction in earning the end result. Serial criminals want to be captured, because in their fantasy the justifiable end of their story is in capture. That is their final glory: to be remembered. We feel justified when we receive punishment for our actions, So when we don’t, which is called grace, we feel the greater punishment: freedom. To the rebellious, foolhardy, evil men living their lives in the jail cell of actions justified by punishment, freedom is the worst torture. We subject ourselves to the thinking that confinement is victory and freedom is loss… But someone eventually caught on. The criminal on the cross figured out the great secret of life. Until a person truly feels worthless, they will never find worth. Until a person is completely broken, they can never be made whole. Until a person is on their last hope, they can never discover the hope of glory. So, you think you’re worthless? If you truly are, rejoice. Until we realize our worthlessness, we can never discover our worth. Not self-worth, but Christ-worth: for without Him, we can do nothing. That’s the definition of worthlessness. But, it’s also the definition of worth. As always, thanks for reading, and find your worthlessness and thereby, your worth. We didn’t get a ton of work accomplished in building the bus yesterday, so I’ll just post three pictures of the same thing. These are basically rafters on which to build the drop ceiling on. Up in those rafters will run the air ducts, lighting, and whatnot. There is about 2 1/2 inches of clearance to work with up there and the ceiling will still be about 6’3 or so. The bus itself is a bit over twelve feet tall with the raised roof, so there should be plenty of room to work with. Those wooden brackets were a pain to make, and there were so many of them. We had four to a beam and six or seven beams. Today was fun. That video is the start of something I’m calling “Songs For The Blog”. Whenever I can, I will post these videos to help you get the message of my post. Some of the songs will be original… This one is a Gold City song. If you’d like to hear the rest of it, you can look up either Gold City or Austin and Ethan. That’s my favorite line in the whole song. Because just the chorus alone sounds like a living for Christ song and doing the right things… But this line adds the dynamic of being sheltered and protected by God’s love. What kind of life would we be living if we had not accepted Christ’s gift? We live by the grace of God, it’s conditional that if He spares our lives His wrath, we must live for His glory. We should want to. Everything: building a bus, singing, teaching, hanging out with friends, listening to music, going to the movies, eating, sleeping, and everything we do should be done to the glory of God; for its only by His grace we can do those things. Just a thought for today, not a theology or theory… Just a simple thought that could change the world. We are in North Carolina and have a few days of free time. So, what do you do when you have a day off from work? You work. Right now, living is a full time job. Between building the bus, singing, and blogging, It’s hard to find time to do anything else. 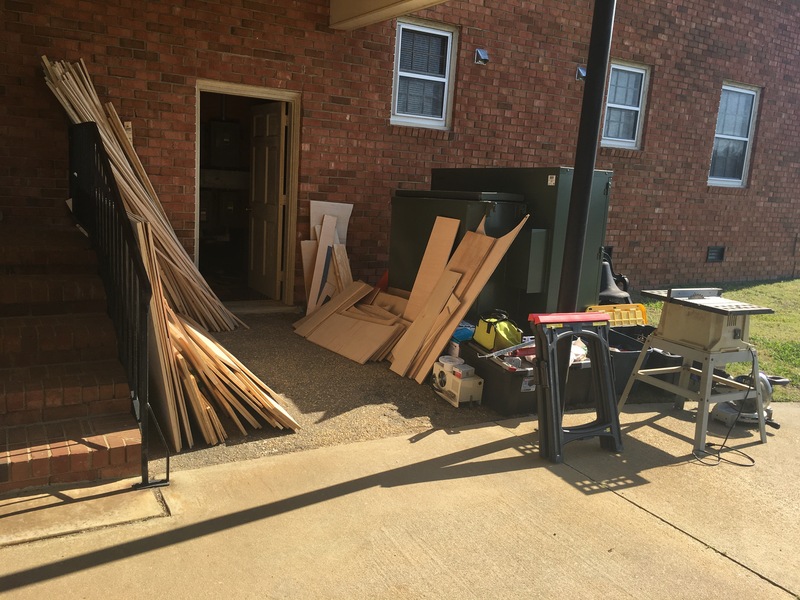 With several days where we can work on the bus, we parked it at a church near our hotel and basically took over their carport area. Lumber and tools all had to come out of the bus, which was a big job all by itself. This is probably the most updated picture of the interior of the bus. It’s still pretty much just the raw wood, but you can see some wall structure going in as the skeleton of the inside is being built. Yikes! At first, it was just the bowed wood that made everything not center or be square. So, we took a string line to it. But, because the bus has an air pressure leveling system, and the front airbag has a leak, the bus leans forward. This caused our string lines to be incorrect. So, much of today was spent fixing things. 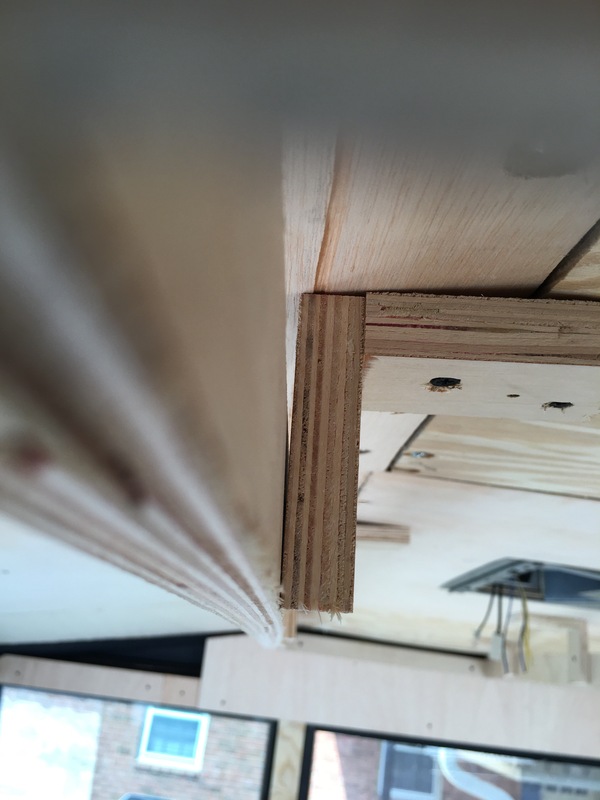 We did manage to get the supports in place for the shelves that the bunk beds will rest on, and started building the support from the front bathroom countertop; found the air leak, fixed all the squaring issues… It was a busy day. Life has been interesting, and it’s been difficult for me to find time for what I consider to be really important. I find that the things I really care about are the hardest to fit into my schedule. I hate having to make room for the most important things… But does that mean they are not the most important things? If I’m not prioritizing them, does that mean I really don’t care that much about them? The big, time-consuming things are big and time-consuming for a reason. The problem is finding out why God put these circumstances into your life and why they are taking the most of your time; then learning from them and using them. God didn’t make them the main thing in your life for you to have to work in the important things around them. They are important, you just need to find out why. I was going to title this post “The Song That Never Ends”, but I decided against it. The song I speak of is not a song that is sung, but the source of all singing. The Song, the Everlasting Song is not something as fleeting as a melody of a single voice. It’s a symphony of praise lifted by the creation to the Creator. This entire week long I’m at a large Southern Gospel music convention in Myrtle Beach, SC where my family will be singing multiple times on various showcases as well as appearing on the “Main Stage”, Saturday night. This is one of my favorite events of the year; not only do I know practically every artist performing, but there is a personal connection with the fans and a spiritual presence in the singing and speaking each night. Every night a preacher will take the stage for 45 minutes to an hour and preach the Word of God. It’s a special time for me, and a tremendous opportunity for my family and I to proclaim the love of Christ to thousands of people. Several of my greatest encouragements in the Southern Gospel realm are at this event, and I’ve already had conversations with them. If inspiration was a place, it would be this week of Singing in the Sun in Myrtle Beach, SC. I find encouragement, reprieve, spiritual convalesce, and inspiration from both God and Man. But more than all of that, it is a place where The Song is lifted up to heaven. The praise of God’s creation is magnified by the voices of 6,000 people to the glory of God the father! The Song is my escape. The praise of my God and my Savior is my bridge, and The Song never dies. As long as this creation has breath he will sing of the creator. I devote myself to The Song to the glory and praise of the great God and the Almighty Creator of heaven and earth. It is my calling and my duty, my peace and joy, my bridge of escape. Everyone needs a bridge. Mine is The Song of creation. What’s yours?